Guards are supposed to keep watch. A watchman sleeping while on post should be punished. In fact in one instance during the American Civil War, a sentinel was caught sleeping at his post, and he was sentenced to be executed by a firing squad, except that President Lincoln pardoned him. Few days ago, I caught one sleeping while on duty. And I even have a photo to prove it. Should I advocate for a firing squad? Several months ago I wrote an article (see blog here) about this unknown critter that has the uncanny knack of pooping on my deck. After months or even years of frustration on trying different things and several animal repellents without success, I finally found the answer. Enter the Havahart Spray Away Elite – motion detector sprinkler. It sprays water like a high-powered squirt gun whenever it senses motion in the area it is protecting. It became the honor guard on my deck. It sprayed water (I think, though I never caught it) to the perpetrator, as it never defecated on my deck again. It also sprayed the sevicemen who were just doing their work or inspecting something on my deck. 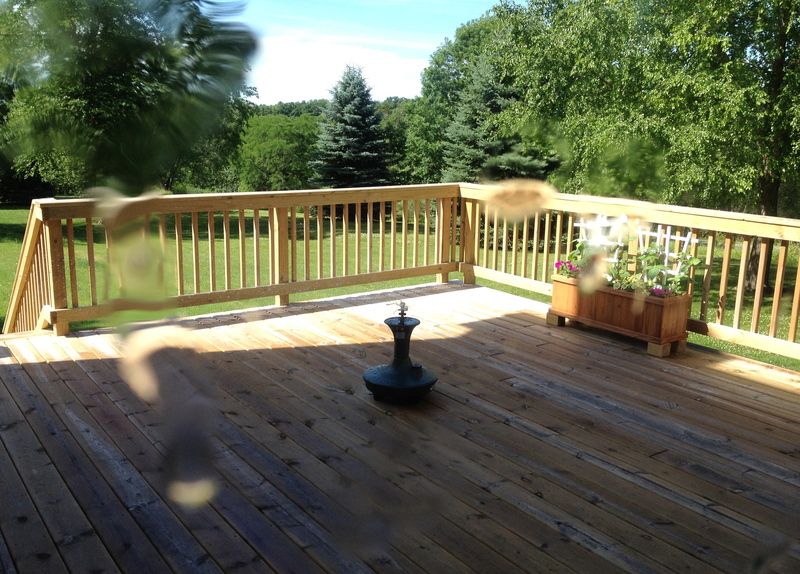 I even lured some unsuspecting guest to take a walk on my deck ……and swoosh! 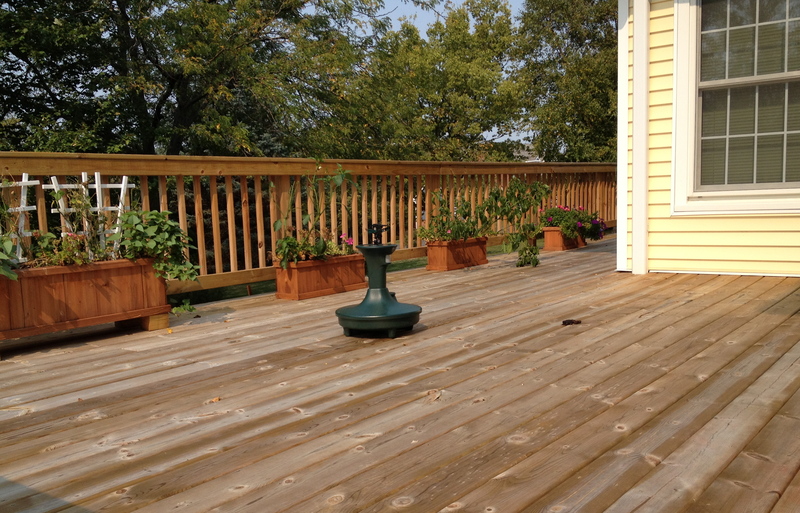 For four months or so, my deck was clean and poop-free. The designated sentinel was highly commendable. But then one morning, I saw this. I found fresh poop on my deck again and its right under the nose of my guard! What’s going on? Is my sentinel sleeping? My watchman failed me! I looked at the sprinkler and the light indicator was blinking that it was on. The solar-powered battery was fully charged. There was definitely water in its receptacle. However, after some more investigation and testing – which includes walking, running and even dancing in front of the Havahart sprayer and not getting sprayed – I came to the conclusion that the motion sensor was not working. My guard was not sleeping. It has gone blind! Obviously it also cannot smell the doo-doo under its nose. What good is a blind sentinel then? It did not need a firing squad. Just fired. As for that pooping creature, that might deserve a firing squad! But I have to catch it first. Post script: Havahart replaced my motion detector sprinkler for free. Now I have a new sentinel on deck. Neat gadget! What’s the warranty on it? Neat gadget indeed…..if it’s working. As for the warranty, I’m still trying to contact the company about it. I just happened upon your Blog – I work for Havahart. Shoot us a call at 1-800-800-1819 and we will get a new one out to you (it’s under a 2-year warranty). Sorry it quit working- that’s very unusual – would love to get it back and understand what happened. Glad to hear from someone with the company. Actually I already called last week and they asked me to fax my receipt. I just need to follow-up with it. I do hope I can have a replacement, for it does a good job….when its working. Excellent – glad you spoke with us and we can fix this for you. Let me know if you run into any roadblocks – I can get you to the right people. I got my free replacement few days ago. Thanks.